Man. Interviews! There are so many things related to interviews that I could talk about. I was working on the outline and I had all these topics and tips written out (so many tips). So instead of trying to cover a bunch of different topics related to interviewing people, I’m going to focus on a couple and give you some solid, practical advice to help you avoid the common mistakes that many podcasters make when doing interviews. Plan out the topic of your podcast before you reach out to the person you want to interview. Be aware of the reason your audience listens to your show, and keep the focus of the episode on that. 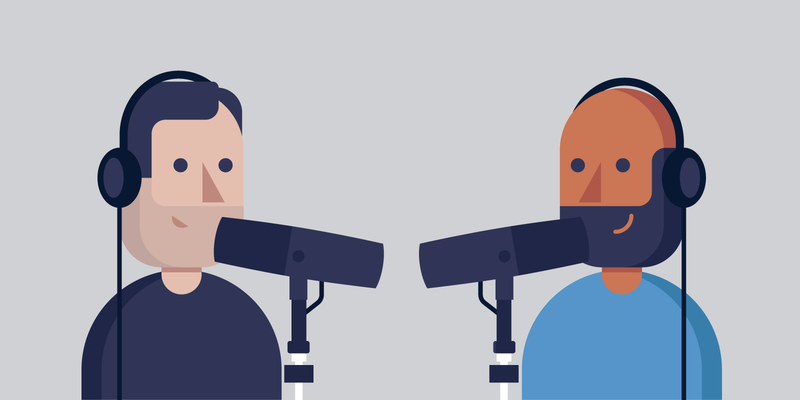 Don’t let a great interview be ruined by poor audio quality or distracting background noise. It reflects poorly on you, but it also reflects poorly on your guest. Do a test recording before the day of the show. This will allow you to spot any issues that will ruin an otherwise good interview. Don’t forget to hit record. Don’t ever forget to hit record. Make sure your guest does as well. 2:49 There needs to be a good reason why you want to interview someone. Don’t ask to interview someone just because you’re a fan of what they do. Explain to them why your audience will be interested in hearing the episode. This may also help you get some of the bigger, more popular names in your industry to come on your show. 3:20 Don’t be afraid to reach out to the big names in your industry, but don’t be surprised or offended if they say no. Certain famous podcasters get asked to do interviews all the time. If you want to increase your chances of getting a yes from a famous podcaster, make sure you explain to them right away why you want them to be on your show, what the topic of the show will be, and how long it will take. Should I Send My Guest Questions in Advance? 4:11 Some people prefer to not send any questions to their guest in advance, but I’ve always liked shows where the questions were asked in advance and the guest has had time to think about their response. I believe it leads to better interviews in most cases. 4:40 I suggest coming up with 3-5 questions that you’d like to ask your guest. Make sure they are things your audience will find interesting as well. Don’t feel married to these questions, though; you can also ask your guest if they have anything they’d like to talk about. 5:09 If something interesting comes up during the interview, feel free to explore it. Just because you prepare questions in advance doesn’t mean that you can’t follow interesting rabbit trails. It just means being aware of what kinds of rabbit trails your audience would be interested in. 5:24 For example, one time (not too long ago) I was editing a web design podcast and their guest started talking about a recent vacation. I ended up cutting about 15 minutes of that out of that interview because really, who cares? The audience doesn’t want to hear about the great time you had on your recent vacation unless it somehow ties in to the point of the episode. 5:58 This ties into to mistake #1. Tell your audience at the beginning of the show what your intent for the interview is. Don’t make them guess. Tell them about the benefits, what they can expect to learn from the interview. Tell them why they should care. 7:04 This is a big one. You have to discuss your guest’s audio setup before the interview, especially if they aren’t a regular podcaster. Find out if they have a mic and if they know how to record an local audio track. 7:33 Email them in advance and ask them about their audio setup. Ask them about the microphone they have. If they don’t have a microphone, make a suggestion (the ATR-2100 is $50 and won’t sound terrible if they have decent mic technique). If they don’t have a mic and aren’t willing to buy one, try to get them to use a USB headset or Apple Earbuds. 8:05 Discuss your guest’s recording location. Find out if they have a quiet place to record in. 8:40 Make sure your guest knows to wear headphones during the call. If they’re talking to you and your voice is coming out of their computer speakers, there’s going to be an echo on their track which will all but ruin the audio file. Make sure they wear headphones while recording. 9:10 Some guests may not be willing or able to record a local audio file, but if you want the best possible audio quality, you need to ask your guest to record a file on their computer with Quicktime or Audacity. Be prepared to walk them through the setup if they don’t already know how (or send them this video tutorial). 10:02 You should also be recording the Skype audio to have as a backup, but explain to your guest that you want to have two options in case something goes wrong with either the local recording or the Skype recording. 10:32 You can record the audio from a Skype call using Ecamm Call Recorder (Mac), or Pamela for Skype (Windows). 11:10 Get everything setup well in advance of recording time. Know your gear. Test it. Make sure everything works. Don’t be struggling to get your gear working when it’s time to record an interview. That makes you look like an amateur. 11:35 Before you hit record, make sure you have Dropbox and any other bandwidth hogging services (Google Drive, online backups, etc…) turned off, and ask your guest to turn them off as well. Spend time researching your guest. Control the interview gently, but try not to interrupt. Ask open-ended questions; try to avoid questions that could be answered with yes or no. Recap the highlights for your listeners at the end. It might be necessary to take notes during the interview if you can (pen and paper instead of keyboard). Make sure your guest has a good experience. Be grateful. Publicly thank your guest for taking time to come on your show and give them a chance to plug themselves and their latest work. 14:42 Think about the reason you want to interview someone. What value will it provide for your audience? 14:49 Be prepared. Know your guest, your questions, and your recording gear. 14:55 Feel free to reach out to big names that you want to have on your show, but don’t feel entitled to their time. Make sure you present a good reason for them to come on your show. 15:05 Email your guest in advance with details about recording time, equipment and recording process, estimated length of the show, any questions you have prepared, and any other important things that they might need to know. 15:20 Ask questions and try to avoid talking more than your guest. 15:25 Be friendly and grateful but don’t gush or be a huge fan boy. 15:30 Don’t forget to turn off dropbox or google drive and hit record. Never forget to hit record. Make sure your guest hits record as well, if they’ve agreed to recording a local file. 18:20 Community member Wouter shared some great tips during the live show, so I wanted to share them with you, dear reader (because you deserve them). Ask “Why?” and “How come?” a lot. Don’t be afraid of silence. Don’t fill in every bit of silence. Most of the time, the most valuable answers come after an interviewee has time to think about their response. Never finish the sentence of your interviewee. Read other interviews that your interviewee has done so that you don’t ask the same exact questions, or so that you can ask beyond those questions. 19:16 Steve Luvender asked: As a listener, I want to hear the interviewee talk and share stories. How can you guide an interviewee to share what’s interesting and relevant while maintaining structure of the rest of your show? 19:30 Discuss the topic and goal of the episode in advance. If they get too far off topic, if they get into talking about something that you know your audience won’t find interesting, then you have to guide the conversation politely but firmly back on track. 20:38 Cory Miller asked: What if you’re the one being interviewed? Is there anything you keep in mind to help the interviewer get the content they need? 20:47 This is where the advice in this episode comes in handy. If someone asks you to come on their show and they’re not telling you what they want to talk about, ask them what the topic of the episode is. Go to their website and find out who their target audience is. Who are they trying to reach with the show? Think about some things that you can share with their audience that will be interesting and valuable.